It doesn't get any easier than couscous and the last of the mint from the garden along with some nearly stale pistachios made for the perfect last minute side dish. The hardest thing about cooking couscous is measuring; it’s a cup and a half of water for each cup of couscous. Add the water and a tablespoon of butter or oil to a saucepan and bring to a boil. Then remove from the heat, stir in the couscous along with a half a teaspoon of salt, cover, and let sit for at least ten minutes. That’s it. At this point I stirred in a quarter cup of chopped pistachios, mint, and the juice of half a lime. However the possibilities are endless; herbs, dates, apricots, raisins, olives, pine nuts, fennel, and lemon come immediately to mind. 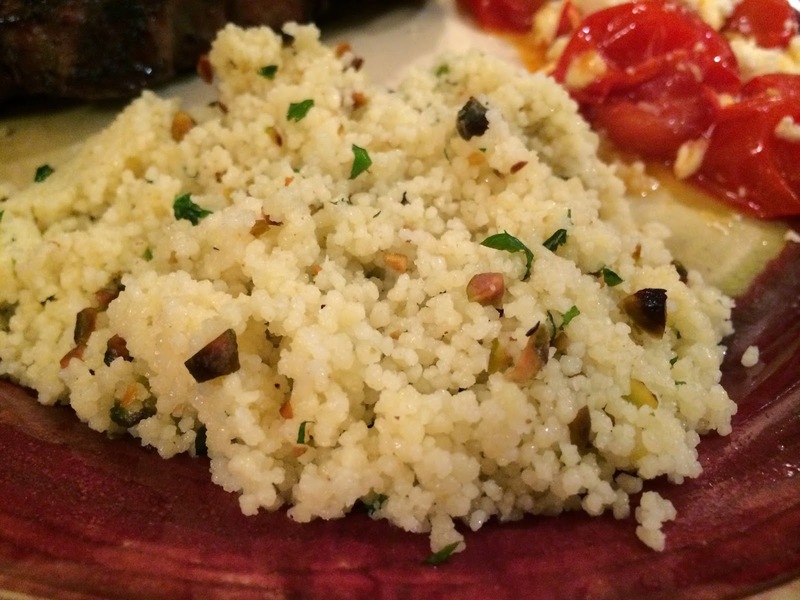 And probably lots more possibilities lingering in the back corners of your fridge or pantry…you just need to have the couscous on hand.